Arcuate eminence: Is it due to semicircular canal? Background: Arcuate eminence (AE) is an arc-like elevation seen on the anterior surface of petrous part of temporal bone in the middle cranial fossa (MCF). It has been believed and conventionally taught that AE is a protrusion caused because of the superior semicircular canal (SSC) present in the petrous bone. AE is an useful anatomical landmark in the MCF during surgical approaches to acoustic neuroma through suprapetrosal approach. However, the relevance of relation to AE and SSC has been questioned in recent times. Presence of AE of various shapes and dimensions supports this view. Aim: To study and to establish the relation between shape of AE and inferior surface of cerebral hemispheres. Classify various types and subtypes in case of variation in shape based on its appearance. AE could be a negative impression of either gyrus or a sulcus. Material and Methods: The study was conducted in two parts. In the first part, the shape of AE and the impression on cerebral surface were correlated while removing brain from cranial cavity in 8 cadavers (16 wet temporal bones). 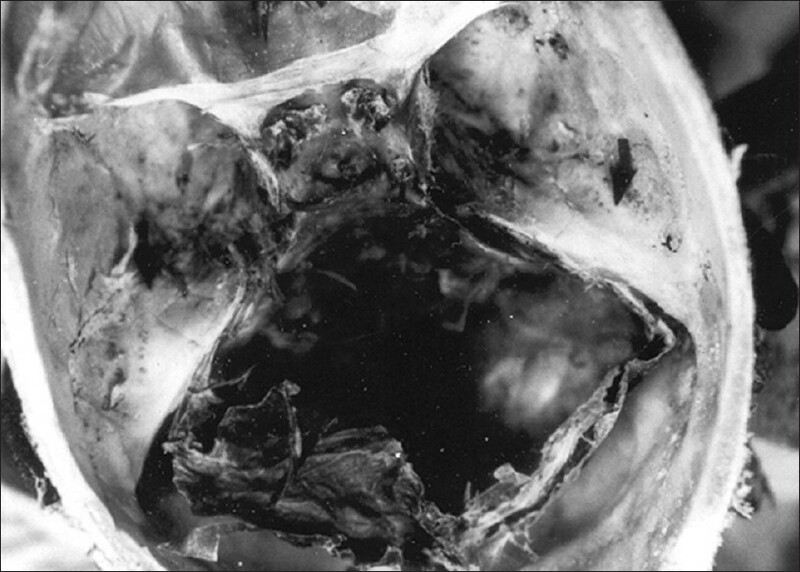 In second part of the study, 100 dry temporal bones were examined. Relevant photographs were taken. 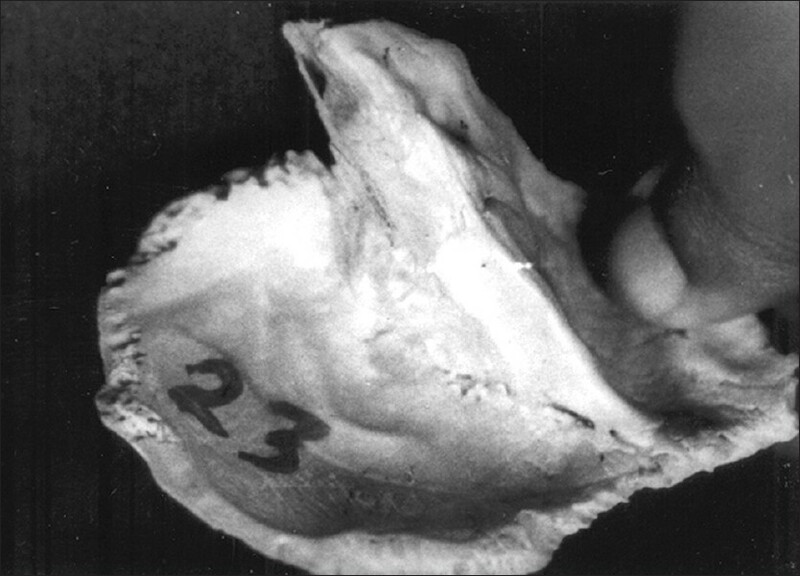 A total of 116 temporal bones were studied. AE was classified as linear, globular, generalized swelling, and flat based on the appearance. Results and Conclusion: 10 AE of 16 wet temporal bones were linear type and did correspond with a sulcus, whilein 1 cadaver no relation was seen. In dry bones, maximum linear variety was seen. There was no relation to shape of AE and cerebral surface in two cadavers. Diversity in shapes, (linear type 47%) and correlation with sulci on cerebral surface contests the earlier understanding that AE is due to SSC. Thickness of bone over SSC was not measured in this study. Having seen so many shapes of AE in this study, authors are of the opinion that there is a need to revisit this bony landmark in MCF and rethink if it can be used as a guide in middle canial fossa surgeries. This study, however, did not look into the bony thickness overlying SSC, which could have added the knowledge of depth of SSC from bony surface of petrous apex. Arcuate eminence (AE) is an arc-like elevation seen on the anterior surface of petrous part of temporal bone in the middle cranial fossa (MCF). It has been believed and conventionally taught that AE is a protrusion caused because of the superior semicircular canal (SSC) present beneath the petrous bone. It roughly corresponds to SSC (Glasscock). AE is found about 20 mm from petrosigmoid intersection and SSC 2 mm deep to surface. AE is said to consist of otic capsule and additional layer of bone, naked otic capsule of normal thickness, or thinned otic capsule (Katsuta). It is also considered to be as a useful anatomical landmark in the MCF during surgical approaches to acoustic neuroma through suprapetrosal approach,  However, the relevance of relation to AE and SSC has been questioned in recent times. The possibility of the occurrence of AE as a result of impression caused by the gyrus or a sulcus on the inferior aspect of temporal lobe during ossification of bones of base of skull cannot be totally ruled out. Presence of AE of various shapes and dimensions supports this view. Hence, authors took up a study looking into various shapes of AE and tried to classify them based on appearance. Attempt was made to see if there is a corresponding elevation or depression on the cerebral surface. AE could be a negative impression of either gyrus or a sulcus. Study was conducted in the Department of Anatomy St. John's Medical College, Bengaluru, to ascertain the causation of AE in Indian population. The study was conducted in two parts. 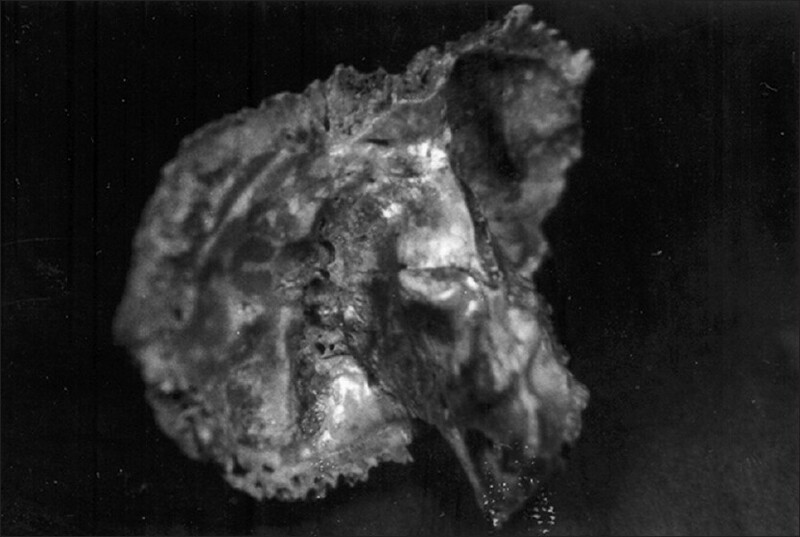 In the first part, the shape of AE and the impression on cerebral surface was observed, photographed, and documented while removing the brain from cranial cavity during dissection. Sixteen temporal bones in eight cadavers were observed. The relation of AE and gyrus or sulcus on the inferior surface of temporal lobe was studied and a photographed with a pointer marking the sulcus or gyrus. In the second part of the study, 100 dried temporal bones available in the department were observed. The shape of arcute eminence was documented and classified. However, the relation of these bones with cerebral surface could not be ascertained. 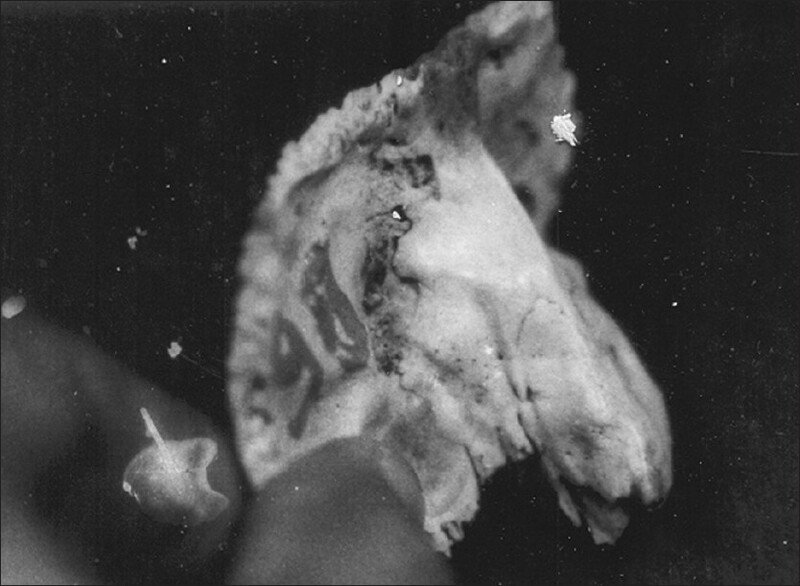 A total of 116 temporal bones (part 1 and 2) were studied. The shapes of AE were classified based on the appearance as under. Linear was further classified as short, branched, and faint. Globular type was subclassified as faint and classical. All the types were photographed. 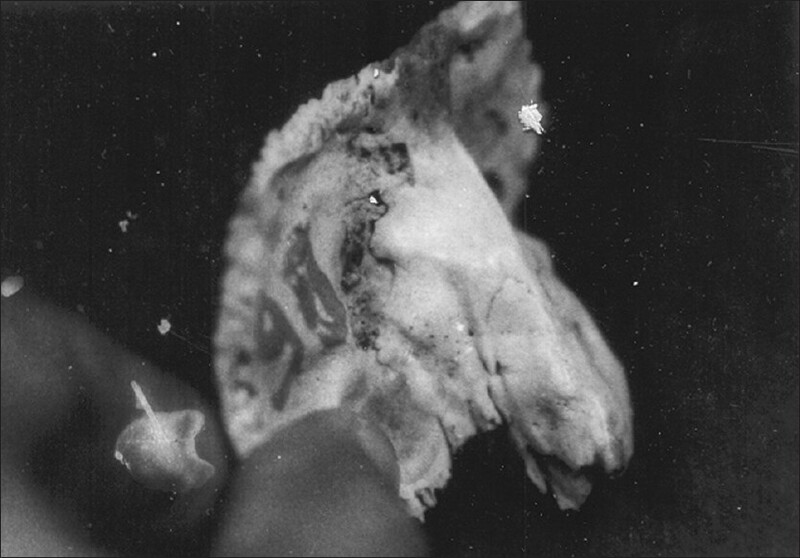 Cranial fossae with brain in situ with a pointer was also photographed [Figure 1], [Figure 2], [Figure 3], [Figure 4], [Figure 5], [Figure 6] and [Figure 7]. Results of part 1 of the study has been tabulated in [Table 1]. Results of the part 2 of the study which includes 16 temporal bones of part 1 and 100 dry temporal bones are tabulated in [Table 2] a and b. 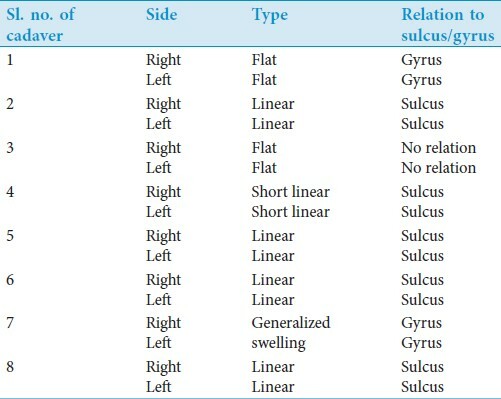 It can be observed from [Table 1] that linear AE corresponding with sulcus on the cerebral surface is seen in temporal bones of 5 cadavers out of eight (10/16 temporal bones). Similarly, flat AE did correspond with gyrus. However in one case AE was of generalized swelling type but did not correspond with a sulcus on cerebral surface though logically expected. [Table 2] reveals maximum number (47.4%) of linear type of AE. [Table 2]a and b, show subtypes of AE adding diversity to the appearance of AE. AE is an elevation seen on the anterior surface of petrous part of temporal bone and is believed to be due to protrusion of SSC. The main finding in our study is diversity in shapes of AE. In dry bones, various shapes of AE were observed and were classified as linear, globular, flat, quadrangular, generalized swelling based on the appearances. Authors have attempted the classification empirically, purely based on the appearance. No such classification seems to be available in the literature. In the study of dry bones, the number of linear type of AE was seen in 47% of bones when compared with other types. In 10 of 16 specimens, a definite relation between the sulcus and linear shape of AE fitting in the sulcus was noticed. However, in one case, the cerebral surface contour did not match with the shape of AE, the reasons for which could not be outlined. It is logical to expect some sort of uniformity in the shapes of AE, if it were to be due to SSC protrusion. Various shapes of AE rule out the notion that it could be due to SSC. Ear develops from auditory vesicles. Mesenchyme surrounding auditory vesicle forms a cartilaginous sheath called otic capsule. Auditory vesicles thus enclosed in this otic capsule, differentiate into a dorsolateral vestibular and ventromedial cochlear part, which forms semicircular canal and cochlea. Ossification of otic capsule starts from 9 th week and completed by 16-23 weeks. 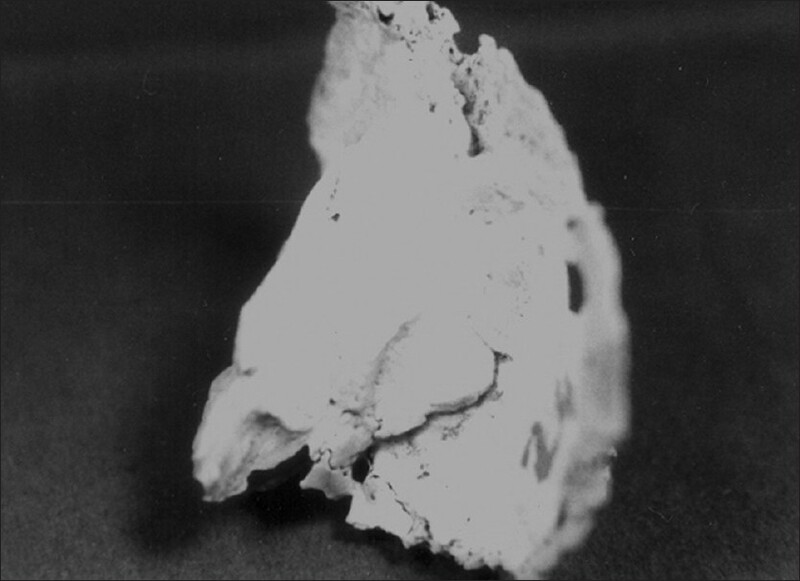 Mean while development of petromastoid part of temporal starts by as many as 14 ossification centers around the otic capsule by 5 th month and completed by 6 th month enclosing otic capsule. During the same time line, development of gyri and sulci of cerebral hemispheres also occurs. By 8 th month most of the prominent sulci are differentiated including those on the inferior surface of the cerebral hemisphere (Peter wiliams). Skull base bones, at this stage of development, being cartilaginous in development are soft and are amiable to moulding by the weight of developing brain. Hence, the impression of sulcus or gyrus on the temporal lobe resulting into varied shapes of AE seems logical. This is something similar to superficial veins in the interior of cranial cavity making deeper indentations than the arteries. The correlation between the shape of AE and the immediate relation of inferior surface of temporal lobe of cerebrum further strengthens authors' contention that AE is probably due to negative impression of either sulcus or gyrus of cerebral surface. In the study, it was also noticed that, in one case, the cerebral surface contour did not match with shape of AE, the reasons for which could not be outlined. It was also observed that 12 AEs were flat, not showing a definite demarcation, which was in line with findings of Kartush JM, Kemink JL, and Graham MD,  who have commented as absence of AE in 50% of temporal bones. In addition, authors found a posteriorly rotated AE in relation to SSC. Authors are of the opinion that because of variable relationship of AE with SSC, former cannot be a reliable guide for SSC. Faura et al,  in a study of hundred homogenous CT of temporal bone have reported that AE was absent in 15% of cases and did not correspond to imprint of a temporal sulcus. The authors noted in 48% of cases, AE was not a good landmark though in 46% of cases SSC was noted toward the medial border of pnuematized eminence. The authors concluded that AE was due to combined effects of SSC, air cells in the petrous bone, and temporal sulcus. The authors also opined that in 37% of cases, AE may be a guide to SSC but cannot be considered as good surgical landmark. In this study, the variation in morphological shapes of AE can be attributed to the punematization of petrous air cells in addition to impression. Katsuta et al did micro-drilling of AE in 43 dry temporal bones and found that SSC was situated 2 mm (range 2 mm-4.2 mm) deep. They were of the opinion that AE consisted of either otic capsule, and overlying bone or thin otic capsule. The range of depth of SSC from AE was attributed to it. In a three-dimensional CT analysis study of temporal bone, Bulsara et al attempted to establish relationship between AE and SSC and found a significant variability. They concluded that AE is not a consistent or reliable land mark for identifying the precise position of SSC. Yoshinobu et al,  in a study of assessment of anatomical relationship of AE and SSC with CT image study are of opinion that AE may be a trace of occipitotemporal sulcus. However, study of 100 CT scans of temporal bone showed that AE was not a good landmark of SSC, a finding in line with observations of present study. Having seen so many shapes of AE in this study, authors are of the opinion that there is a need to revisit this bony landmark in MCF and rethink if it can be used as a guide in middle canial fossa surgeries. This study, however, did not look into the bony thickness overlying SSC, which could have added the knowledge of depth of SSC from bony surface of petrous apex. There is a need to study this landmark in other populations as well. Our understanding that AE is a marker of SSC needs to be revisited. The variation in thickness of bone the overlying SSC, possibly be a cause for varied shapes and dimension of AE. 1. Gulya JA. Anatomy of temporal bone and skul base. In: Gulya JA Minor LB and Poe DS, editors. Gkasscock-Shambaugh surgery of the ear, 6 th edn. Connecticut: People's Medical Publishing house; 2000. p. 32. 2. Katsuta T, Matsushima T, Fukoui M, Rhoton AL. The architecture of the arculate eminence- a microanatomical study and its application to the transpetrosal approach. Skull Base 2001;11:165-8. 3. Faure A, Masse H, Gayet-Delacroix M, Khalfallah M, Bordure P, Hamel O, et al. What is the arcuate eminence? Surg Radiol Anat 2003;25:99-104. 4. Tsunuda A, Kimura Y, Sumi T, Komatsuzuki A, Sato T. The arcuate eminence is not a protrusion of the superior semi-circular canal but a trace of sulcus on the temporal lobe. J Laryngol Otol 2000;114:339-44. 5. Williams WR. Grays Anatomy. 38 th ed. New York: Churchil Livingstone; 2000 p. 571-91. 6. Bulsara KR, Leveque JC, Gray L, Fukishia T, Freidman AH, Vilavicencio AT. Three-dimensional computed tomographic analysis of the relationship between the arcuate eminence and the superior semicircular canal. 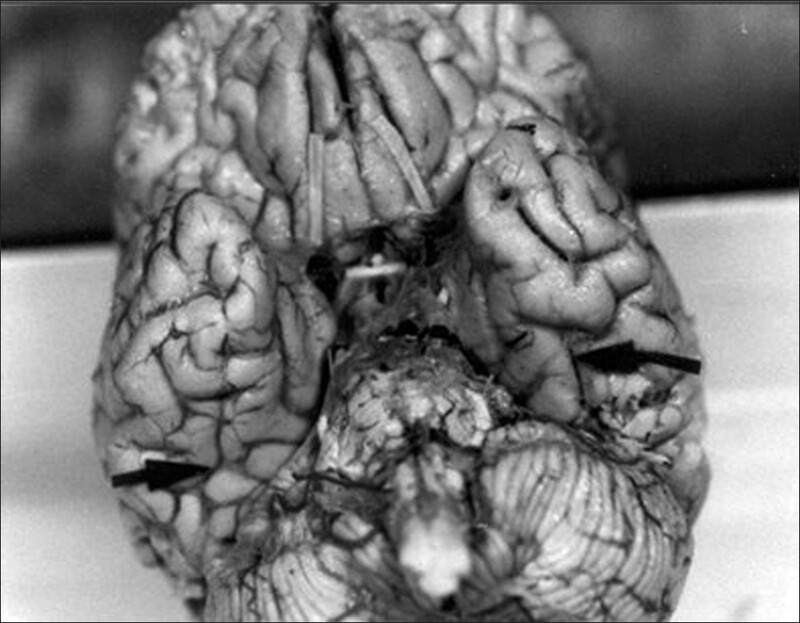 Neurosurgery 2006;59(1 suppl 1) ONS7-12; discussion ONS7-12. 7. Tsunoda A. Arcuate eminence in caucasian populations. J Laryngol Otol 2001;115:9-13. 8. Kartush JM, Kemink JL, Graham MD. The arcuate eminence. Topographic orientation in middle cranial fossa surgery. Ann Otol Rhinol Laryngol 1985;94:25-8. 9. 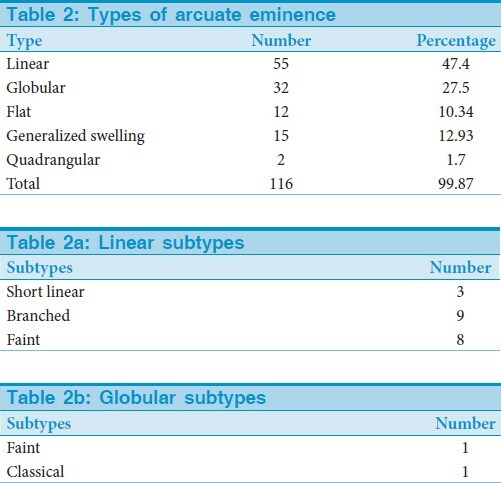 Seo Y, Ito T, Sasaki T, Nakagawara J, Nakamura H. Assessment of the anatomical relationship between the arcuate eminence and superior semicircular canal by computed tomography. Neurol Med Chir (Tokyo) 2007;47:335-9; discussion 339-40.